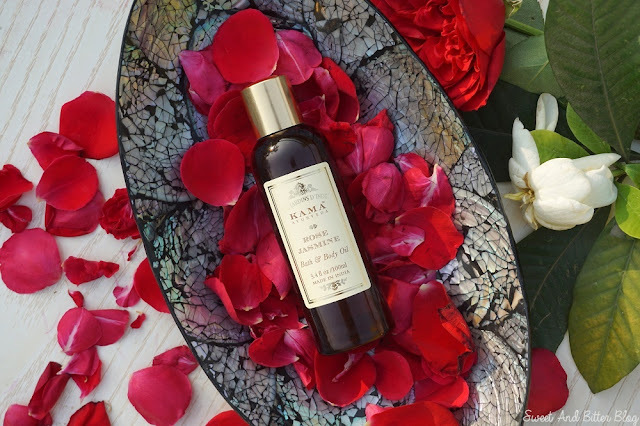 This Kama Ayurveda oil can be used as a pre-bath massage or as in the bath. Being the rebel I am, I majorly used it up for post-bath massage. Yes, I have finished the bottle. Ingredients: As expected from Kama Ayurveda, there is no mineral oil. Wheatgerm Oil, Soyabean Oil, Organic Almond Oil, Sesame Oil, Vitamin E, Heptyl Undecylenate (Castor Oil Derivative), Rose and Jasmine Essential Oil. I love the oil on the wet skin more than dry skin. This is one of the primary reason, I used it post-bath. When the skin is wet, the oil seeps right in and moisturise it well. I love the everything about the texture and ingredients. I think that I will take a quick shower after the massage, but I feel so good cocooned inside the envelope of oil that I vote against it. Now, this is the point I am going to say - But. But, the fragrance is not what I expected it to be. The main reason anyone will pay more for a body oil is premium ingredients and enchanting fragrance. 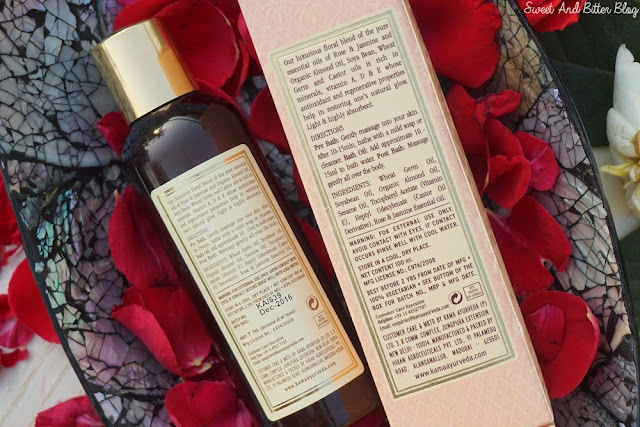 Though the aroma is good and it is not like what I expected from the rose jasmine range of Kama Ayurveda. It is not like the cleanser even after I warm it up. It is more 'nuttier' than refreshing. Overall: I do recommend the oil - good ingredients and easy to absorb. 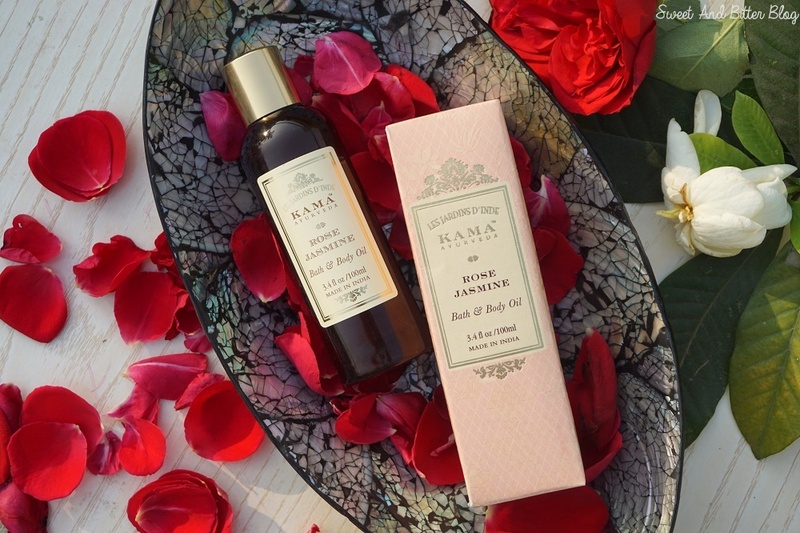 If you are aiming for it for the fragrance of the cleanser then maybe you can try other oils from Kama Ayurveda. 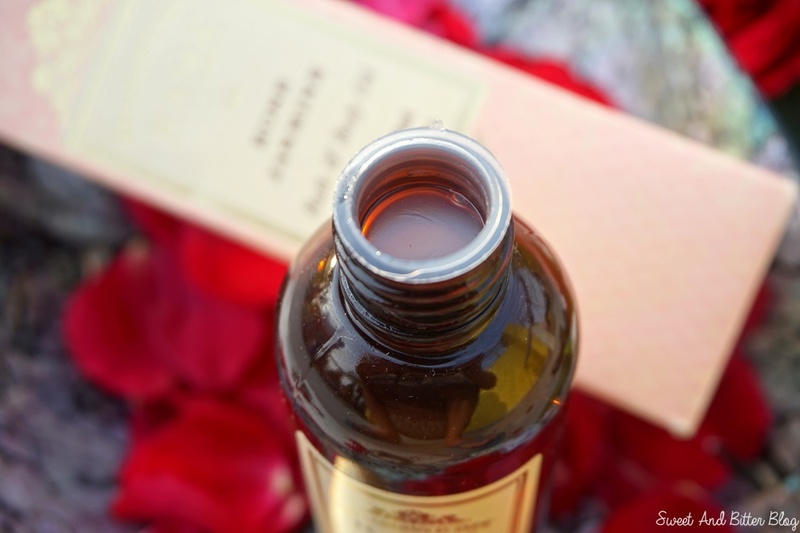 Which is your favorite body oil?